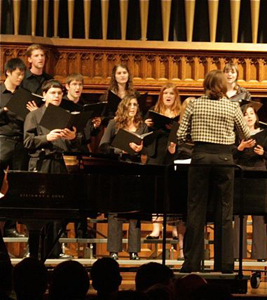 The Case Western Reserve University Early Music Singers were founded in 1978 by Beverly Simmons as part of CWRU’s nationally renowned Historical Performance Practice program. Since 2016, the group has been directed by Dr. Elena Mullins. The Early Music Singers’ repertoire ranges from medieval chant to Renaissance madrigals and masses and occasionally to baroque operas and oratorios. The group varies in size but is usually about 16-22 singers. The personnel includes undergraduate and graduate students (of voice, composition, musicology, mathematics, computer science, engineering, and business), as well as other individuals associated with CWRU, including a cardiologist and a clinical researcher. All of them love making music in a small choral setting. EMS rehearses Tuesday evenings, 5:30-7:30. Normally, there is one concert per semester in Harkness Chapel, the Music Department’s recital hall, and occasionally some smaller events as well. We are also frequently asked to perform at the Cleveland Museum of Art down the block. To arrange an audition, contact Elena Mullins at ecm74@case.edu.